I’ve never really been one for strict routines. When the boys were babies, we used to go with the flow and most of the time it worked really well. It meant we could go out and about without it interfering with nap or feed time too much. I have friends with very strict routines and they allow themselves almost no freedom. They cannot come out at certain times of the day and I didn’t want to become like that. When the twins came along, we decided that things had to change. No longer could we use a baby led approach as there were now far too many babies in the house! So, we adopted a routine and it has been working pretty well. The routine does have flexibility so we are not completely housebound and the routine is relaxing slightly as everyone gets older. Here is a day in my life. Our days usually start about the same time and if we go out for the day we try to travel at nap time. 7.30 am – wakey, wakey, rise and shine. Anybody who is not already awake gets woken. First job of the day is a production line of nappy changes! 8.00 am – feeding of the masses. It’s breakfast time for the boys while I make the girls bottles. 8.30 am – baby feeding time. I’ve mastered the art of feeding both at the same time so this has halved the amount of time taken. The boys tend to watch a bit of Cbeebies while I do this. 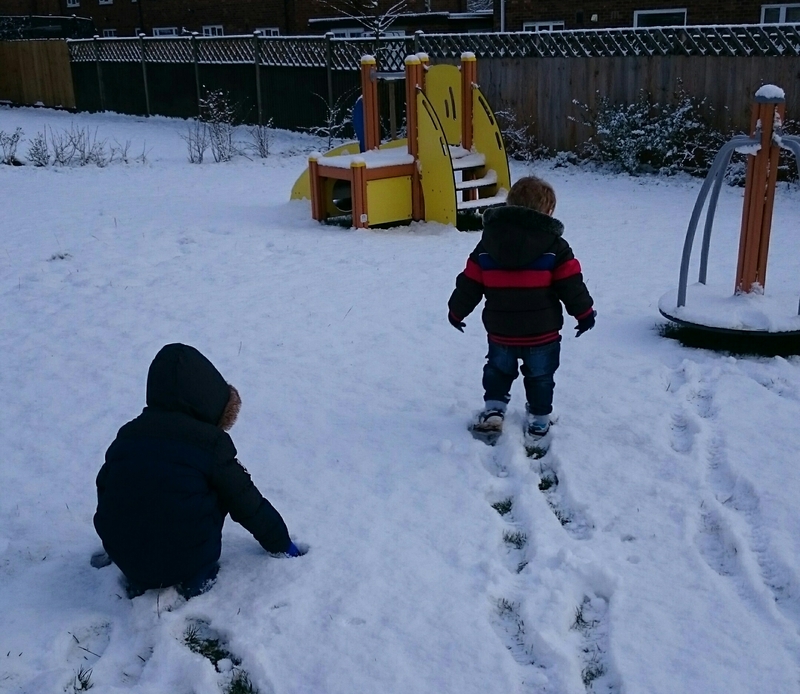 9.00 am – activity time or off to nursery on a Thursday and Friday. I try and set an activity up for the boys so I can grab a few minutes to do something like tummy time with the girls. On a Tuesday my lovely Home Start volunteer comes around this time and entertains the boys. They love having someone different to play with. 10.00 am – twin nap time. Parenting suddenly gets so much easier when there’s only 2! I realise how easy life was with just 2! I’ll try and play a game with the boys while their sisters are asleep so they get a little bit more of Mummy’s attention. 12.00 noon – lunch time for the biggest ones and around the time the twins usually wake. I feed the biggest ones and myself first while the girls have a kick around on the floor (it’s the safest time). 12.30 pm – solid food time for the girls. Before I clear up too much I let them add to the decoration on the floor! 1.00 pm – clear away lunch items and load the dishwasher. Make bottles for the girls and carry on feeding. After lunch is quiet hour for the boys. We try to watch a film and have a few minutes peace, quiet and rest. 2.00 pm – it’s girlie nap time again so once they are asleep I have time to play with the boys. We tend to try do something active like put on music and dance around like nutters or go play in the garden. One afternoon, a few weeks ago, we played in the snow and last week we planted all our spring bulbs. 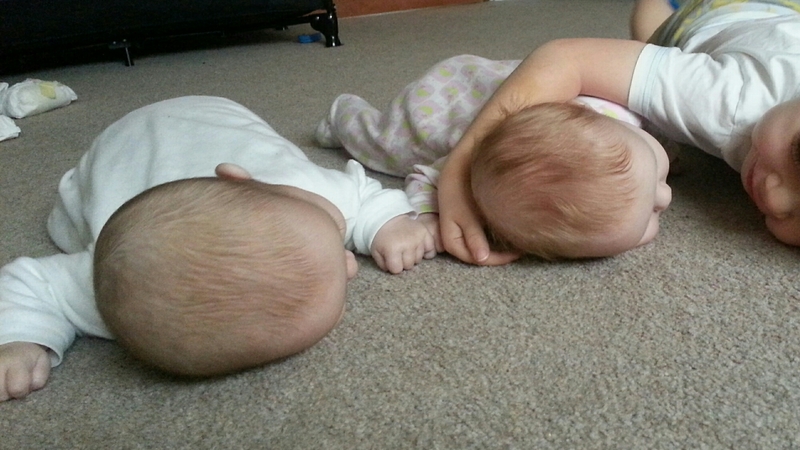 3.30 pm – the twins are usually awake by now. I’ll get them out their cot and bring them down to play with the boys. They love playing with their sisters and can often be found waving a rattle in their face or kissing them. That’s probably how the girls get poorly so often! 4.00 pm – it’s bottle time again. Sometimes the boys like to help otherwise they are left to their own devices for half an hour while I feed. We’ll probably have Cbeebies on or they’ll play their new favourite game, supermarkets. 5.00 pm – it’s time to start thinking about dinner and battling to keep O awake. He dropped his nap around his 1st birthday and refuses to have it even though he needs it. This means that from late afternoon, if we have been busy, he gets very sleepy. If he naps we wouldn’t be able to get him to bed at night so have to keep him awake! 5.45 pm – dinner time. Feeding time at the zoo begins all over again! 6.30 pm – Daddy is home just in time for bath and bed. The boys have to tidy up all their toys before they go up to bed. Luckily O is a bit of a clean freak and loves a good tidy! 7.00 pm – I change and feed the girls while Daddy does the boys bedtime story. Usually everyone is sound asleep by 7.30 and I collapse in a heap, satisfied that I did a fairly good job keeping everyone alive! Actually, scrap the collapsing in a heap. I start the household chores otherwise they would never get done. 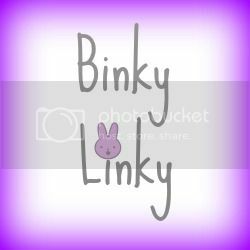 Interesting read – I also have 4 #binkylinky It will be food time as I post this!